After reading many books on Minimalism I have been trying to reduce and organise my belongings so that I am only left with items I actually use and love. This way I will have more time to do better things and also focus better on what really works. I am trying to document as much of this as possible so that I stick to my resolutions and also to hopefully show other people that they are not alone in having too much stuff. What better place to start me minimising efforts than my beauty products collection. I have lots of beauty products (as I sure you can imagine) but I even shocked myself when I decided to photograph all the little repositories I keep them in. 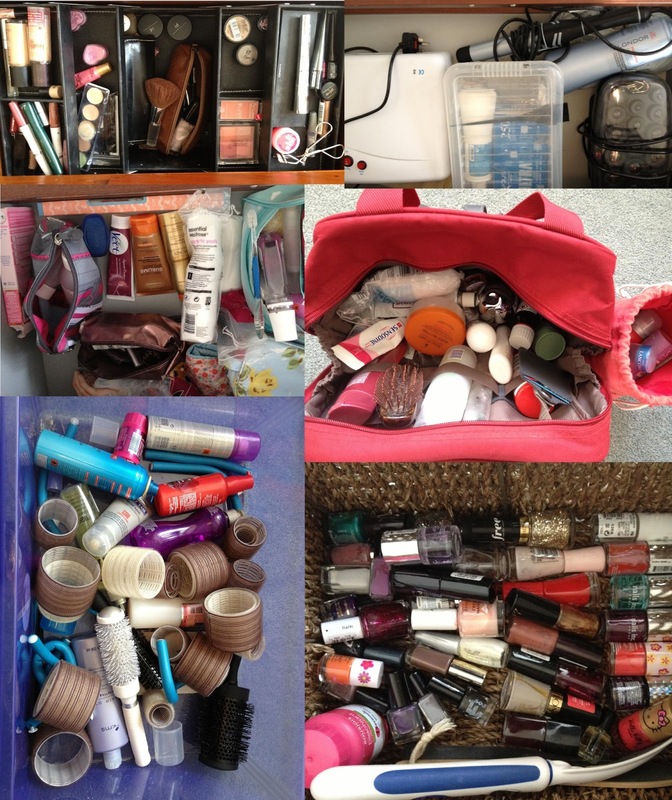 These photos don’t even include my handbag makeup bag or the one in the car! This is ridiculous, I don’t even use half of them as they are a big pile of poop or I was given them as gifts. I really need to sort this out and reduce this to a more manageable size. 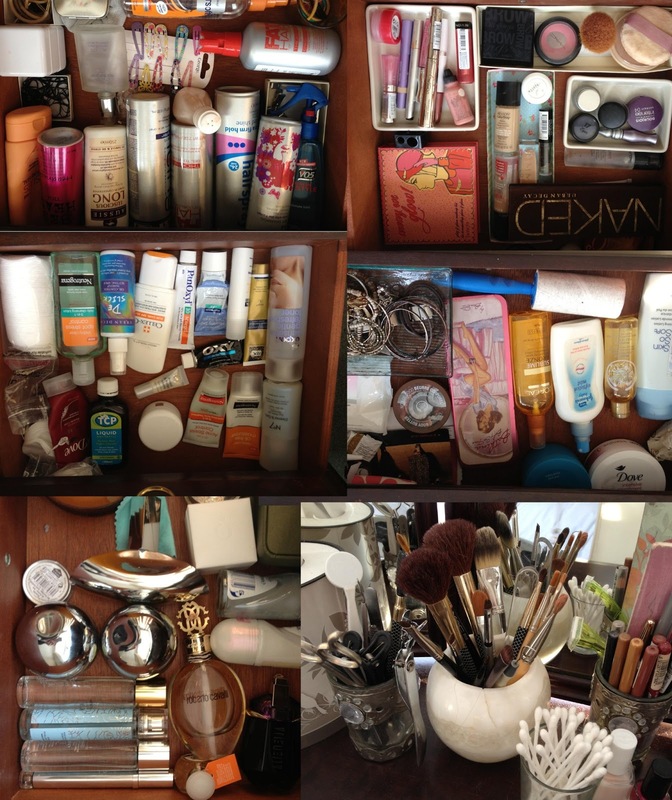 My house isn’t exactly tiny, but no-one (even Katy Perry) needs this many products. Anything I wouldn’t repurchase but that does the job, stays and needs to be used within 2 months (these things will go in strategic places so that they get used up. I hate waste and so find it hard to just get rid of things if they can be of use. All discarded products will be boxed up and put on Freecycle, I am the local moderator and hate sending anything that can be used by others to landfill. I have done this twice before and have always had loads of takers, just because it doesn’t work for me doesn’t mean that someone with opposite beauty needs won’t think that it’s great. Honestly with all of this I should look like a supermodel! Ridiculous. It’s also a sad testament to the overconsumption of the West. I am actually pretty ashamed to own all of this. It shows how marketing is such a lie, I think I honestly believed that by buying these products I really would be more pretty, more youthful, more whatever. Most get used once or twice, don’t deliver what they promised and then languish in one of these drawers. 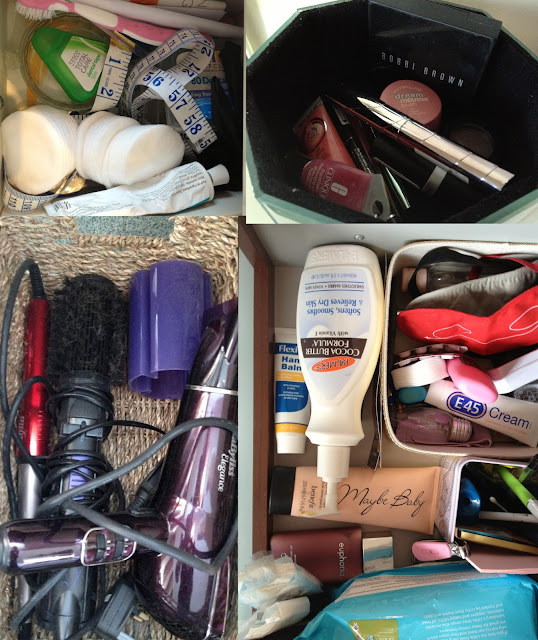 You are going to feel so much better after you downsize your beauty products. I have to constantly do this lest it start to creep back up into a huge collection. I am down to one drawer that is crammed full of things I really don't need but should probably get rid of. This just may give me the push to get it done. 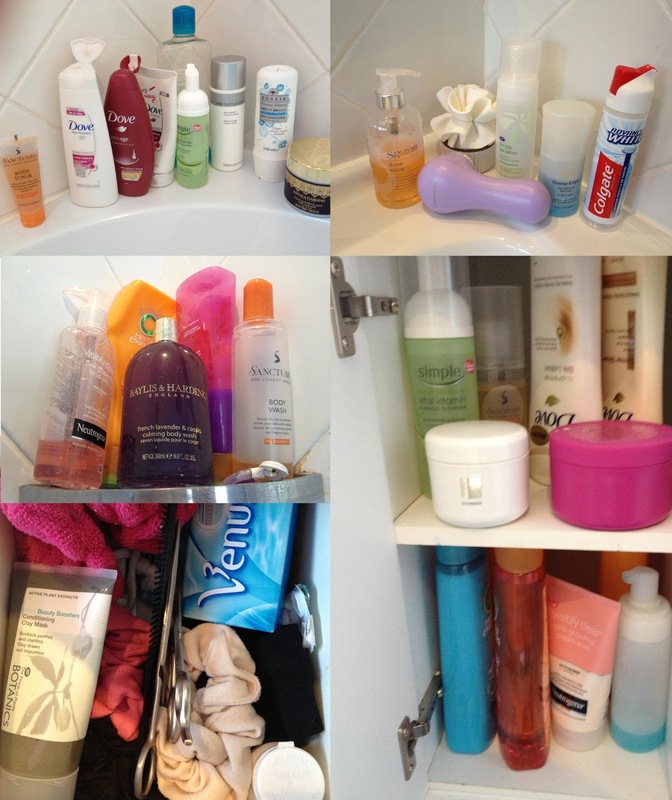 I have become pretty good at avoiding overbuying beauty products after a big purge which rid me of some 4-5 years old stuff! I do not buy a color I already have (be it eyeshadow, lipstick, etc) even if there are minimal differences – i.e., a sheer lipstick vs a matte one. You can have the effect you want by layering – same is true for eyeshadows! For stuff like shampoo, conditioner, face cleansing or moisturizing stuff, etc., I only have the one I am using now and its replacement. And I don't start using the replacement until the open one is finished to the last drop! That saves money and space, and avoids impuls buys at the drugstore. WOAH. I thought I had too much stuff but you are next level (I'm jealous!). How big is your dresser?!!? Amazing! Also, you just know Katy Perry would and does wear all of that…at once! I love Katy Perry! I wish I could get away with wearing all that makeup! I wrote this a year ago, I don't have the courage to go and re-take these photos as I fear they would show my beauty products are right back at square one. cringe.